SURREY, B.C. 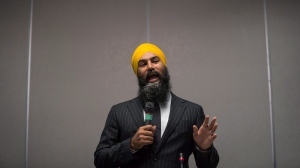 -- Federal NDP Leader Jagmeet Singh took aim at conservative politicians Wednesday while lambasting Prime Minister Justin Trudeau for abandoning a campaign promise to bring in electoral reform. Singh told his caucus during a retreat in Surrey, B.C., that Trudeau's explanation for disavowing the promise was that he was worried a new electoral system might facilitate the rise of far-right, fringe parties. "First-past-the-post didn't stop Doug Ford from coming into power in Ontario," Singh said, to laughs and applause from NDP members of Parliament. "It didn't stop him from using the notwithstanding clause to continue a petty vendetta against the City of Toronto, to abrogate our charter rights to continue this vendetta." Ford invoked the rarely used clause on Wednesday to overrule a court decision and reduce the size of Toronto's city council from 47 councillors to 25. Protesters and most of the Opposition were ejected from a chaotic legislature as Ford reintroduced the council-cutting bill. Singh, a former NDP member of Ontario's legislature, also noted first-past-the-post didn't stop Conservative Leader Andrew Scheer from appointing a former Rebel Media news director as his campaign head. Conservative Party spokesman Cory Hann confirmed Hamish Marshall will be the party's campaign manager but didn't have an immediate statement on Singh's comments. The current electoral system also didn't stop Quebec MP Maxime Bernier from launching an "anti-immigrant" political party, Singh added. Bernier left the Conservatives to start his own party last month after butting heads with Scheer over supply management and making headlines with controversial tweets about immigration and diversity. When an electoral system allows the views of a minority to win out over the majority, it doesn't stop fringe politicians, it encourages them, Singh said. "That's why we've got to stop it. 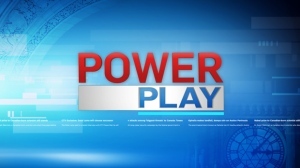 We've got to bring in electoral reform to bring power and voice to people." The caucus retreat has arrived at a challenging time in Singh's year-old leadership as he faces criticism from party loyalists about his effectiveness and weak fundraising. He has announced he will run for a seat in Parliament in Burnaby South, a riding held by New Democrat MP Kennedy Stewart who is campaigning to become Vancouver's next mayor. Several caucus members defended Singh on Wednesday when reporters questioned how well-known he was in the riding, and whether the party has fallen behind under his leadership. "Obviously, we have a lot of hard work to do," said NDP House Leader Ruth Ellen Brosseau, adding Singh has visited her riding in rural Quebec three times and he's well-liked there. "He's working really, really hard. The fundraising, obviously, the numbers weren't as we would have hoped. But in an election year ... I'm very confident we're going to be doing a lot better." The leader could improve upon "understanding and bringing forward concerns of everyday, real Canadians," Brosseau said, and raise those issues in the House of Commons while offering concrete solutions. Singh visited Victoria for the Pride Parade in early July and held up marchers behind him because so many people were mobbing him for selfies, said B.C. MP Alistair MacGregor. "I know there's this narrative being driven in the national media and by our political opponents ... but what I see on the ground is very different from the stories that we read." David Coletto, the CEO of polling firm Abacus Data, said NDP supporters had high expectations for Singh, contributing to some of the disappointment around his performance. "There was a sense he probably had the best shot at rekindling interest in the New Democrats in the Trudeau era, where you have to be charismatic, you have to have an interesting story and you have to connect with voters in a way that is emotional, particularly for those on the left," he said. But he hasn't been effective at setting an agenda, getting attention or rallying Canadians around any issue he's talked about, nor has he been able to lead a caucus well and keep his party united, Coletto said. It is critical for Singh to win the byelection in Burnaby South, Coletto added. "He's running basically in ground zero on the pipeline debate," he said. "If he can't take advantage of that issue there, where it is being built, how is he going to take that message across the country?" During his speech to caucus earlier Wednesday, Singh criticized the Liberal government for "leaving Canadians on the hook" for its $4.5-billion purchase of the Trans Mountain pipeline. The Federal Court of Appeal has quashed Ottawa's approval of the expansion project and ordered it to do further consultation. Singh's leadership under microscope as NDP MPs prepare to meet in B.C.